An electron is attracted to the nucleus of an atom but remains in an orbital around the nucleus. Niels Bohr originally modeled the electron similar to planets orbiting the Sun, although it is now known that the electron does not take a path that is consistent with planets. In fact, it has probable locations where the electron may reside in an orbital. Yet, the electron will annihilate with a positron which has the same charge as the proton. What’s the difference? In the explanation of the proton, the proton consists of both negative and positive particles that will both attract and repel the electron. A proton is known to be a composite particle, including at least three quarks and more likely five quarks in a pentaquark structure. As spherical longitudinal waves converge on these particles, each particle rapidly spins creating a transverse wave as calculated as gluons in the strong force equation. However, this axial, transverse wave will pass through at least two of these “quarks” in a proton, continually increasing transverse wave amplitude each time it passes through a quark. The next figure illustrates this transformation through two “quarks”, creating the gluon (in red) and continuing as a transverse wave until reaching an orbital electron at a distance (r). The strong force has a remnant effect, and one that causes an electron to stay in an orbital around a proton, as opposed to annihilate like it does with a positron. The repelling force is labelled as the orbital force. It is very strong within the proton but the transverse wave declines rapidly with the cube of distance. Meanwhile, the electron is also attracted to the positron in the proton with destructive, longitudinal wave interference (electric force) that declines at the square of distance. The resulting sum of these waves and their amplitudes creates a position where the forces are equal and the electron establishes its “orbital”. 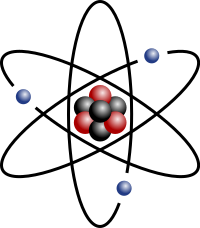 A single proton and electron is hydrogen. 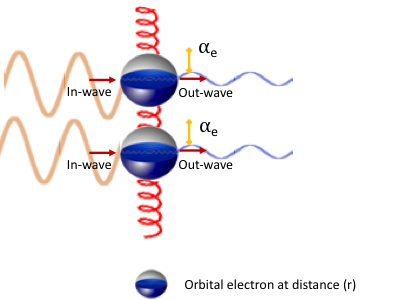 It has two forces – the attractive electric force and the repelling orbital force (F1 and F2) – but the latter orbital force only occurs when the electron is in alignment with the axial transverse wave. In other words, it only occurs when two or more quarks are in alignment with the electron. This is illustrated in the next image. When the electron is in alignment, the orbital is where the forces are equal (known as the Bohr radius – a0). When the electron is not in alignment, it changes the force on the electron and it continually moves around the nucleus and has a probable location. Beyond hydrogen, additional protons and electrons in the atom adds to the number of forces that act upon electrons and their orbitals. The Atoms section details the methodology for calculating the orbital forces to determine electron orbitals and photon energies. When a wave passes through two quarks/electrons in the proton before repelling the orbital electron, the simplified version of the force equation looks nearly identical to the strong force but the effect on Q1 is squared. This is the repelling force that keeps an electron in orbit, balanced by the attractive positron in the proton that attracts the electron. * The orbital force of a single proton. For various atom configurations, see the explanation of orbitals in the Atoms section. A wave passing through a proton that coincides with the axis of two “quarks” in a proton goes through two transformations as it passes through particles. The orbital force equation models the effect that it has on an orbital electron. This example uses hydrogen, where the orbital electron is known to have the best probable location at the Bohr radius (5.2918E-11 m). Comments: The orbital force calculation for hydrogen matches the electric force at this distance (difference of 0.000%). By declining at the cube of distance, the orbital force will eventually reach the same amplitude as the electric force – where the electron has a stable orbit – but only when aligned on the axis of this transverse wave. At other times, it has a probable location, creating a strange orbit around the nucleus. See orbital distances for calculations of other atoms beyond hydrogen.